Carlsruhe, Or Karlsruhe, a city of Germany, capital of the grand duchy of Baden, 39 m. N. W. of Stuttgart, and 18 m. K N. E. of Baden-Baden; pop. in 1871, 36,622. It stands on an elevated plain of the Hardt, about 5 m. from the Rhine. The town was built around a hunting seat erected in 1715 by Charles William, margrave of Baden, whose remains are interred beneath the pyramid dedicated to his memory upon the market place. Carlsruhe was designed in the form of an extended fan round the grand-ducal palace, from which, as a centre, 32 public avenues radiate, 11 of which, forming the principal streets, have been built on both sides. 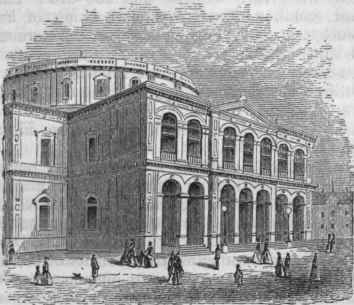 The new theatre and the academy are the finest buildings of Carlsruhe; the former, a commodious edifice, erected within a few years, being especially conspicuous. The palace, erected in 1751 on the site of the old structure, is built in the old French style of architecture, and consists of a large centre building and two wings. It presents nothing remarkable except the Bleithurm (lead tower), which affords a fine view over the city and surrounding country. Of the public squares, the palace and market squares are the most beautiful. The educational institutions of Carlsruhe are remarkable, especially the polytechnic institute, which is attended by many pupils from distant countries. It has a lyceum, a seminary for teachers, a military academy, an academy of design, painting, and engraving, a cabinet of natural history, a gallery of engravings, a grand-ducal archa3-ological cabinet and one of medals, a court library with 90,000 volumes, and a public library with 105,000. The public parks and the trees planted in the squares constitute the chief beauties of the place. There are several palaces belonging to the Baden nobility, and about 100 public buildings, including the churches, the mint, the school houses, the hospitals, etc. Among the hospitals is one endowed with $44,000 by the celebrated London tailor Stultz, who was a native of Baden, and whose munificence was rewarded by the grand duke with the title of baron. A majority of the inhabitants are Protestants. The new Protestant church, built in 1807, is a noble Roman structure. The synagogue is in oriental style, and the Catholic church has a fine portico with eight Ionic pillars. There are here some manufactures of silks, woollens, carpets, jewelry, and chemicals.